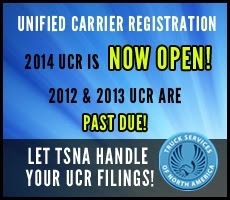 2014 Unified Carrier Registration is open and the deadline to register is December 31, 2013. The Unified Carrier Registration (UCR) Plan and Agreement are part of a Federally-mandated, State-administered program where states collect fees from motor carriers, motor private carriers, freight forwarders, brokers and leasing companies, based on the number of qualifying commercial motor vehicles (CMVs) in their fleets. The revenues generated will be used for enforcement of motor carrier safety programs. The 2014 UCR fees remain the same, with no increase. States are implementing UCR audit procedures that in some states can be in excess of $1000 for your first offense. You are required to maintain three years proof of UCR registration, so you will want to make sure you are registered for the last 3 years.